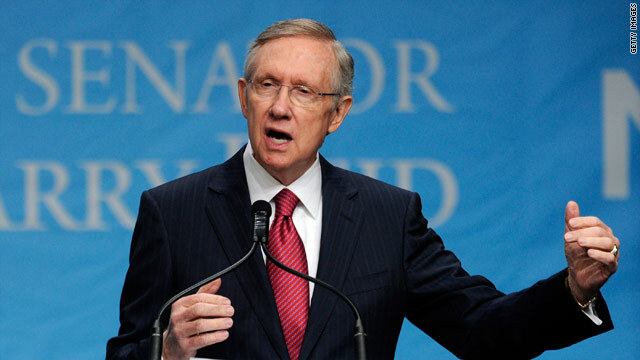 Washington (CNN) - Senate Majority Leader Harry Reid, D-Nevada, said Wednesday he would ask the Senate to approve quickly a $6 billion emergency spending bill to replenish the Federal Emergency Management Agency's cash-strapped disaster relief fund. The measure would then have to be voted on in the House- where Majority Leader Eric Cantor, R-Virginia, has insisted any federal funding to deal with the recent spate of natural disasters be offset with cuts elsewhere in the federal budget. Democrats, worried a budget fight could delay aid getting to disaster victims, believe an emergency supplemental spending bill will be harder for budget minded Republicans like Cantor to oppose. “I hope my Republican colleagues will put politics aside and work with us to get the American people the relief they need now,” Reid said. For his part, Cantor, while not responding directly to Reid, pushed back at the notion that he was planning to hold up relief money for areas hit by Hurricane Irene and other disasters. “I am not for taking hostages here. I just think we can act responsibly,” he said. Cantor noted that his Virginia district was hit hard by the two back-to-back natural disasters last month – first the earthquake and then the major flooding caused by Hurricane Irene. “Don’t tell me that we don’t know from disaster,” Cantor said firmly. While Cantor insisted no emergency aid would be held up he didn’t specifically address how the House would handle approval of additional FEMA funding. Reid is just another thug in the nasty group known as the Obama Regime. Eric Cantor is one cold fish. His mother-in-law runs his household so he has to throw his weight around and destroy the rest of the country for what HE wants, with no regard for the other 300 million people in this country. Cantor is either abandoning his Tea Party or he is kowtowing to reality and actually going to do something for Americans in need. Eric it's time to man up and do what you were elected to do – take care of your fellow Americans. So we see that the GOP has really no intrest in helping the American people that are truly in need. Ron Paul wants to do away with FEMA in which many Americans have needed the support of in order to recover from disasters and now Canter is not wanting to give FEMA the money it needs to help out. WOW!!!! Shame on you GOP you are not for the people but for your own pocket books. It's time for a new government that actually cares for its people. Where is the part about by the people for the people in the country? Also, the American government should be afraid of its people not the people afraid of its government. WE have so turned our backs on the US Constitution in this country its not even funny. Cantor is back pedaling from his outrageous statements faster than a circus clown. Good. Now let Cantor take Federal funds already allocated to his state for other programs and decide which ones should be used for disaster relief. After all, we can't continue with our deficit spending, can we. He could show a wonderful example of how to rob Peter to pay Paul. Cantor and the Tea Party Hobbits have been holding this country hostage for over two years. Eric Cantor is such a lying weasel. He definitely meant what he said that before any federal aid could be provided to the victims of natural disasters, the costs must be offset by spending cuts else where. After severe criticism, Eric Cantor has found himself alone out on a limb abandon by his party and facing the possibility of being kicked out of congress in 2012. Why are the Republicans so good at taking things hostage??? Cantor, we the people are sick of your games and politickin'.Just do the will of the people. And we don't mean the rich and powerful. We need to have people in Congress understand that people need help from the federal government without worry. The private sector won't help out unless they can make money at it. That is why the federal goverment is the only one source of help that covers everyone. To have to cut other programs to help those hurt by disaster is just plain hurtful. We need to prioritize, but there shouldn't be worry about people in need not getting the help they need. Cantor: "I have never, never said that I am holding anything hostage or would be playing politics with this." money you requested? Naw, didn't think so. I think federal disaster relief should be offset by cutting Congress reps salaires and eliminating their lifetime health care coverage and retirement payments. I dare the Republicans to withhold FEMA aid. I just dare them. There are people in this country devastated by Mother Nature and they will not appreciate being pawns in yet another Rethug scheme. FEMA is a much needed agency and it should be well-funded to aid Americans when natural disasters happen. Sometimes you can't do it alone, sometimes you need help. The truth can hurt. Mr. Cantor has not advanced the idea of federal disaster relief because of Hurricane idea or the earthquake centered in his district. Mr. Cantor made a statement he would like us to forget. He made a mistake and is unwilling to admit it. We can never stop federal disaster relief because it might cause an unbalanced budget. "Where there is a will there must be a way." Adjustments can and should be made later. It is time for him to change his words and to think for himself without TEA Party assistance. Obviously, Cantor doesn't care if his constitutents affected by the disaster get aid or not. Vote him in again next year Virginians. See if he cares about anything but cutting taxes for the rich and corporations then. I thought Pelosi and Reid were big pay as you go fans? So now when Cantor simply wants to pay for additional FEMA funding he is somehow holding up funding? It has not been held up yet. Cantor has no intention of holding it up. So what in the world is Reid harping about? The idea that Cantor wants to hold up FEMA funding is a total lie. Reid has said many times he is a fan of pay as you go. So find 6 billion in cuts somewhere else. Can't be too hard in a 3.8 trillion budget full of waste and over spending. The only way it would be held up is if Reid refuses to follow his own rules. Reid should shut up and quite lying to the American people and do his job. If Reid won't work with the House, the House will simply write a funding bill paid for with some spending cuts elsewhere and send it to the Senate with plenty of time to spare. And all Reid will have to do is get it passed in the Senate. The only hold up will be if Reid holds it up. And what does this have to do with the TEA Party? Don't Democrats believe in pay as you go anymore? Obama/Reid/Pelosi, lies, lies and more lies. Cantor and the rest of the GOP domestic terrorist organization need to be tried and shot for treason and crimes against humanity. Hopefully both sides will put country first instead of party and help those suffering from the last earthquake and hurricanes. This whole dem vs gop thing hasn't helped us at all and only hinders progress. Attacking one another and putting party first over everything else doesn't help anyone, especially those in need of emergency aid. Tantrum boy, you said it. It's on TV, it's on the radio, it's on the internet!!! This isn't an insult that you can pretent didn't happen. This is NOT the first time you want to blackmail the country with your insanity!!! This is going to follow you come election time. I want to see you get out of this one. Remember macaca (sp)? That worked out well for your VA buddy, didn't it? Sounds like Cantor is lying again and saying he never said what the records shows he did in fact say. These GOBPbaggin' cult members are masters of lying and hypocrisy.